Ready for two-day battery life from your phone? Update: The Moto E5 family does indeed include a vanilla Moto E5 phone in addition to the Moto E5 Plus and E5 Play. Here's the updated news. The Moto E5 Plus proves that Motorola's entry-level phone series no longer looks or performs like an entry-level phone series in 2018. It's taken big steps, according to today's announcement at the Moto G6 and Moto E5 launch event. What's changing is the fact that the Moto E5 Plus marries a massive 5,000mAh battery capacity to an equally large 6-inch screen that sports the new 18:9 aspect ratio. It's similar to the screens we've seen from many flagship phones. It's a great looking smartphone that's supposed to last two days on a single charge. Behind the expansive LCD display are mid-range specs: a 12MP rear camera, 8MP front-facing camera, Qualcomm Snapdragon 435 chipset, 3GB of RAM, and 32GB of storage. You can always increase that storage space with a microSD card, adding another 128GB of space to the phone. Some regions may get slightly different specs, like the Snapdragon 425 chip, 2GB of RAM and just 16GB of storage – likely for a much more appealing price. Motorola hasn't officially announced a Moto E5 Plus price, but last year's phone cost cost $179.99 / £159, so we're expecting it to be just about the $200 range. In the US, the phone will be sold and priced by Verizon. If you’re not all about that big battery and impressive glass design, the Moto E5 Play might be for you. It's, so far, a US-exclusive phone. This plastic 5.2-inch phone shares a lot of what we liked in the E5 Plus, like Android Oreo support, expandable storage via microSD and a fingerprint sensor, but packages it all in a much simpler, ruggedized chassis. Where this one stands out is with its replaceable battery and lower price, which is likely to be around $100 (£100, AU$100). 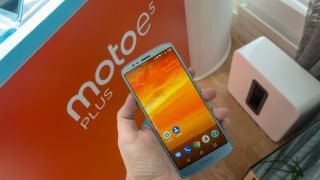 In between the Moto E5 Plus and Moto E5 Play is a vanilla Moto E5 that's destined for Europe, Asia and Latin America, according to Motorola. It boasts a 5.7-inch Max Vision screen, meaning the 18:9 aspect ration that we like about the 6-inch Moto E5 Plus. The difference is that its specs are a little more lightweight, depending on your region. It has a Snapdragon 425 chipset, 2GB or 3GB of RAM, and either 16GB or 32GB of internal storage. The battery is 4,000mAh, which is still a sizable capacity, and it charges at 10W with what Motorola calls a Rapid Charge (as opposed to its 15W TurboCharger). On back, theres's a 13MP camera. The Moto E5 colors will come in Fine Gold and Flash Gray and lacks any sort of water protection. For that, you're going to need to upgrade to the Mot G6 line. Want more? We have additional coverage of Moto's new phones, including the first word on the Moto G6 release date, with the company unveiling five different devices today.